Yes, you read it right. The solid single-pole architecture with finely polished chrome base is available along with 100 long bags. The dual bag holders of the stand allow you to hang many umbrellas in one single unit. Its mounted customizable sign frame provides opportunity to write a warm message for your personal visitors. It is also a good branding tool for brand builders can make best use of the standby placing it in public areas or in official entrances along with their brand message and logo. Available in Silver and Black color, the stand is ideal for keeping not only umbrellas but also walking sticks. The metal mesh constructed stand is known for durability and convenience. The bottom of the structure holds and retains water and prevents leakage into the floor. As the structure is raised from the floor, credits to its innovative design, you need not worry about scratches. Further, the larger diameter of the stand gives you enhanced space to keep more sticks and umbrellas. If you are looking for some antique collection, the model from Breslo makes an ideal choice. Choose your desired color from Golden Brown, Bronze and Mahogany and give a classical touch to your house. Its spacious design fits all the umbrella sizes, from small to large. The decorative architecture of the stand is sure to steal every visitor’s attention. Further, the finely covered bottom deters water leakage into your floor. Above all, you get an inner removable drip tray which helps you to catch the drips and enjoy quick and easy cleaning. 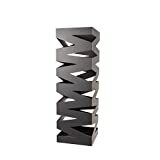 Based on contemporary and elegant theme, the umbrella stand is preferred for its light weight and durability. The bamboo-crafted material ensures higher sustainability and longevity. Its open salts design allows continuous air ventilation to keep umbrella dry. Besides umbrellas, you can also keep walking canes and organize your doorsteps. The best feature about this stand is its free-of-cost dripping pan, made of cast iron metal. Your floors are unharmed and you can clean the stand at ease. Another wonderful product from Mind Reader, the pure black stand is good for use in both domestic and official premises. The multi-purpose stand has space for more than 4 umbrellas, walking canes and sticks, depending on its size. Besides providing enhanced space, it is strong and light in weight. You can easily move it from one place to another without developing any scratches on the floor as the structure is raised above the floor. The fine mesh construction gives sufficient breathing space to the umbrella and facilitates quick drying. Overall, it is an elegant piece of architecture to have it in your office or home. 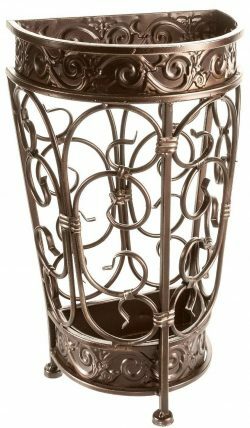 The handcrafted umbrella stand is extremely stylish and classic. Its metallic design is the first thing to steal the attention of your visitors. The fine-quality metal finish makes it suitable for use in both indoor and outdoor. Its sufficient space accommodates many umbrellas based on their sizes. The well-built structure prevents water leakage in the floor. More than its functional aspects, the umbrella stand is famous for the aesthetic value of its design. If you are looking for something truly unconventional and out-of-the-box, Imax 47098 should be your choice. 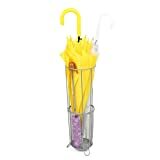 Ever wondered having an umbrella stand featuring umbrella theme? If not, it is time to think and have one. 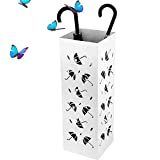 The Amzdeal umbrella stand is a modern and elegant model known for its versatile functionality. Firstly, it stores umbrellas along with walking sticks, baby toys, etc. Secondly, it can easily fit into a corner and save space in your home. Thirdly, it has an exclusive drip can that takes water from your wet umbrella and prevents wet and slippery floors. 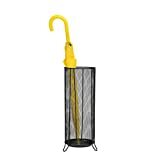 Above all, the flat umbrella stand is rust-resistant and odor-free. An amazing model from Breslo, it is one of the first choices of every consumer. To start with, the rubber-protected bottom of the stand protects the surface of your floor. The removable inner bin holds every drop of water and saves your home surface from getting wet. Further, the structure has enough space to fit in large umbrellas along with yardsticks. Lastly, the brushed stainless steel material makes it last longer than most other umbrella stands. 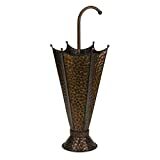 If there is any umbrella stand whose theme will match with your home decor and furniture, it is this and only this. A cat patterned black painted piece, it assures longer and more stable performance. You can place it on your doorstep or in your living room. The good quality finish makes it resistant to rust. The round bottom of the stand retains water from wet umbrella and deters it from leaking into the floor. In addition to a trendy drip tray, it has a special holder cane rack which you can use as a display unit; thereby add more glamour and novelty to your abode. 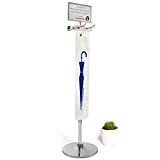 The best of all umbrella holders, a compact and innovative stand, is most recommended for a number of reasons. The first mention should be made of its design. Sleek, elegant and trendy, the entire unit is bound to change the overall look n feel of your house. The second outstanding element is the ventilation which facilitates the unit to hold moisture and dry the umbrellas in a short time span. Thirdly, its durable storage rack makes it rust-proof and prevents water leakage into the floors. Lastly, you save a lot of space and organize your gateway perfectly.